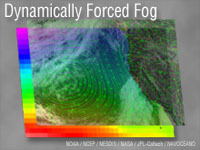 Fog frequently forms in response to dynamically forced changes in the boundary layer. This module examines dynamically forced fog in the coastal and marine environment, focusing on advection fog, steam fog, and west coast type fog. The focus of the module is on the boundary layer evolution of air parcels as they traverse trajectories over land and water. The module also examines mesoscale effects that impact the distribution of fog and low-level stratus over short distances. A general discussion of forecast products and methodologies concludes the module. The questions was very challenging which gave me the motivation to work hard and research really increases your knowledge so u gain in other words. Very interesting lesson. Although I am not sure if all of described types of fog appear in small Baltic Sea. these are on the job trainings for me and i intend to go back and review some modules again. Good material. Examples and questions throughout the module keep the reader engaged.